Internet, e-commerce, affiliate marketing, contextual advertising, social networks, mobile banking and numerous other e-innovations gave rise to new kinds of business models as well as reinvented old tried-and-true models. In the most basic sense, a business model is the method of doing business by which a company can sustain itself – that is, → generate revenue. The web changes traditional business models. 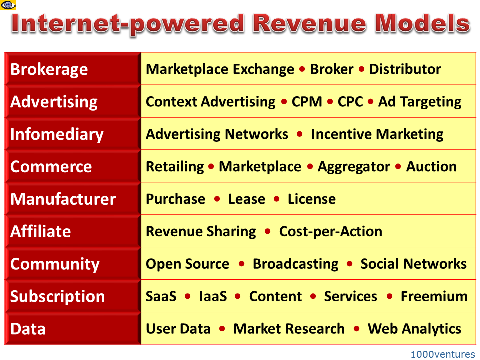 Internet business models continue to evolve. A firm may combine several different models as part of its overall Internet business strategy. New interesting variations keep emerging. Freemium is a pricing strategy by which a product or service (typically a digital offering such as software, media, games or web services) is provided free of charge, but money (premium) is charged for advanced features, functionality, or virtual goods. Software as a Service (SaaS) is a subscription-based software delivery model in which software and data are centrally hosted on the cloud. SaaS has become a common delivery model for many business applications.